Nobody can do it like a Dampf Lok! – Sunshine. Whimsy. Tacos. It would be fair to say that a great deal of my musical taste was formed in the 1980s. Brian, my best friend at the time, was constantly sharing music with me, and I absorbed it and ran with it. He introduced me to diverse artists such as Kraftwerk and Mannheim Steamroller, both of which I still love to this day. Then there were the musicals. I’m an unabashed and admitted musical theater geek, but I wouldn’t be if Brian hadn’t had musicals in the collection. In 1984, he got the soundtrack to a new Andrew Lloyd Webber show that had just hit Broadway called Starlight Express. The show is about toy trains come to life in the mind of a small boy, and it’s a spectacle- the actors portraying the trains perform on roller skates. I wanted to see it badly. The original Broadway run was only a few years, but the UK show was on the West End in London for years- over 7400 performances. In the early 1990s, I found out that another friend of mine, Chris, had been to see it in London. He told me that he fell asleep during the show because he was jet-lagged, and I never quite forgave him for that blasphemy. 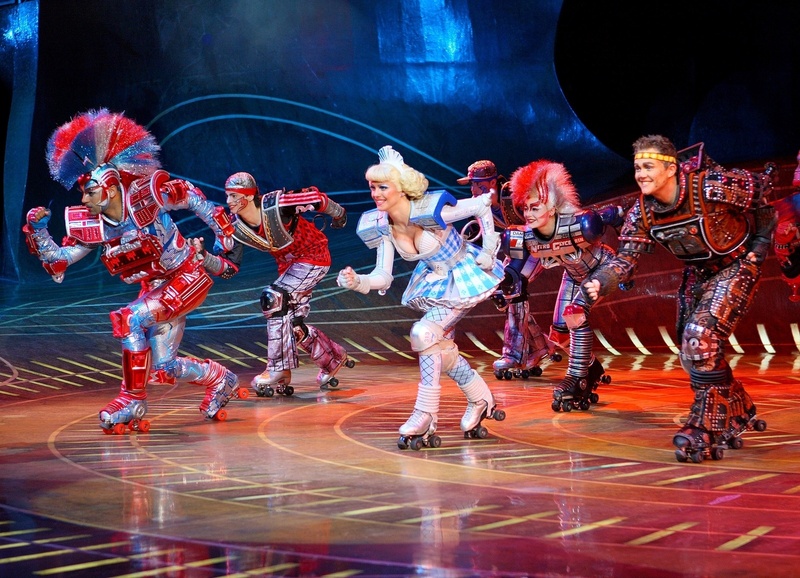 In 1992, the London show was heavily revised as “The New Starlight Express,” and a new cast recording was released. I didn’t care much for the revisions- they removed a villain character who I always felt was vital to making the plot interesting. They also dropped a few songs that I was particularly fond of, and added a bunch of new songs that I didn’t think were as good. I still wanted to see it though. About two months ago, I was perusing a list of live music scattered around Germany. 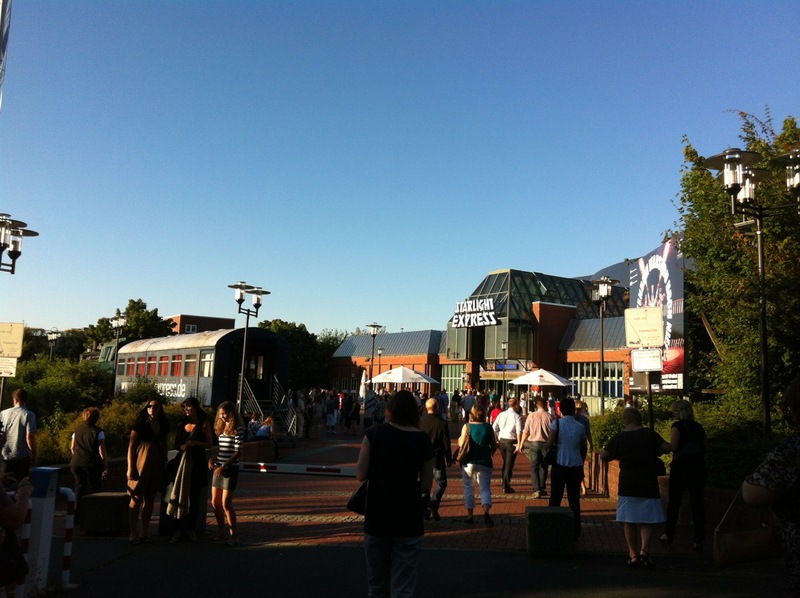 Concerts, musicals, and the like were all represented, and I saw that Starlight Express was in Bochum. A quick map check showed me that Bochum is easily reachable by train, and I put it on my list of “I’d like to do that sometime” jaunts. It’s a pretty big list. My travel schedule has been pretty full this summer, and I was trying to stay put for a few weeks just to recharge. That was the plan, anyway. I got bored on a Sunday, though, and it was all over. By dinnertime the next day, I had a ticket for the show, rail tickets there and back, and a hotel booking about two kilometers from the theater. Twenty-eight years after I first heard the music, I was going to see Starlight Express. In German. I went to Bochum on a Saturday morning, with tickets to the show that evening, and what I learned when I got to Bochum kind of blew my mind. I traveled there under the assumption that this was a touring company, and that it would be in Bochum for a few months tops. I was hugely, wildly mistaken. The Bochum show has been there since 1988. 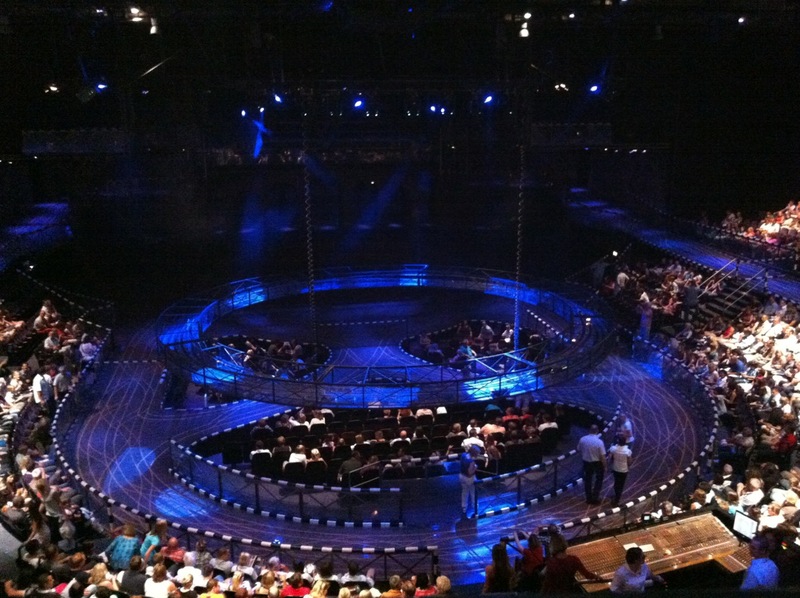 The Starlighthalle, the theater this production runs in, was custom built for this show. The production has been running there non-stop for twenty-four years. When I got to the theater, an LED sign over the front doors proudly proclaimed that I was going to be viewing the 9,464th show. The decorations inside are themed for the show. The cast is listed on a train station flip-board over the front doors. 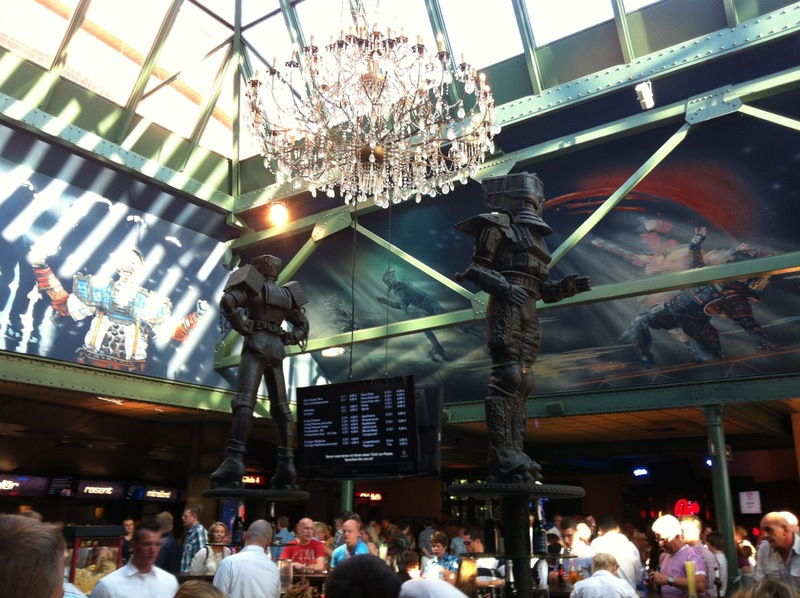 Bronze statues of two engines who are not in the current version of the show flank the snack bar in the center of the lobby area, surrounded by colorful paintings of the characters. I arrived at the theater a little bit early, had a pretzel while I was waiting for the doors to open, and explored the merchandise counter. I was busy being thoroughly disappointed with the t-shirt selection when I found my second big surprise. The soundtrack recording available at the show was a double CD, just like the original Broadway. More importantly though: the soundtrack was the 1989 Bochum cast recording. In other words, it had the original songs auf Deutsch, even the ones that have been cut from modern productions of the show. My 1984 self would have been ecstatic. The staging is almost a separate character. There are U shaped tracks on several levels. There are set pieces that raise and tilt, and bridges that rotate almost 180 degrees to fill different needs. The characters can do tricks and stunts on certain sections of the stage. There are three seating sections where the action happens around you. You can see them clearly in the picture below, from before the show started. Partway into act one, I got my third big surprise of the evening. The Bochum show isn’t updated fully to the 1992 version. It’s kind of a hybrid of the original 1984 broadway version and the 1992 revision. They did change the song lineup somewhat- they added the newer songs that I don’t care for, and they still dropped some incidental characters. To my absolute glee, however, the villain who I thought would be removed from this version was still in the story. There were other changes which made sense. The songs in German were not a direct word for word translation of the English versions. They couldn’t be- they needed to fit the music and the rhythm, but the meaning of several of them was a bit shifted to fit in the language. It didn’t matter though- I’m so familiar with the original cast recording that I was singing the English version in my head. The musical also added a “megamix” of the show’s themes at the end, which makes this the only musical I have ever seen with an encore. There were also changes to the trains- in the original version, the German train is eliminated in an early race. The German show changed that so that the national train (decked out with an ICE train design) makes it to the final race. Additionally, three characters from the original version, Rocky I, Rocky II, and Rocky III were changed to Hip-Hopper I, Hip-Hopper II, and Hip-Hopper III. Admittedly, the Rockies were a bit dated once the 1980s were over, so that wasn’t too bad. The whole show is a little bit dated, now that I think about it- I’m quite sure I heard a keytar at one point. Full disclosure- I did not take the picture directly above this note. I can’t remember precisely where I found it, but I like it a lot. It gives you a good sense of what the show looks like. All in all, Starlight Express is an excellent show. I’d see it again. Maybe I’ll try to get back there for their 10,000th show. I love Starlight Express! I was one of the fortunate people who got to see the London production in 1990. Such a wonderfully cheesy show. I would love to see it in German.